The polish removes rust, fingerprints, powder residue and more without harming the hot blued finish, stainless or nickel. Can be used in the bore and will not change how the gun fires. USDA approved and non-toxic so it's perfect for that hunting knife too. The Cleaner includes a degreasing agent that will remove fingerprints, oil, powder residue and more. This is safe for all surfaces of your gun and knife. The Wax is made of Brazilian Carnauba and Beeswax. Will not leave any white residue and will not build up. 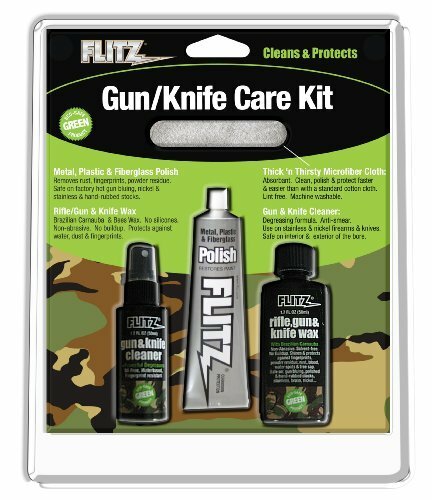 Works great at protecting all gun/rifle finishes and stocks as well as all surfaces of your knives. The thick and thirsty microfiber cloth included works with all cleaning and wax products in this kit and so much more. Special Shipping Information: This item cannot be returned and has additional shipping restrictions.